Here at Ahlan Aqaba Scuba Diving Centre every one of us is dedicated to caring for our reef and the environment in general. We are very active in showing this, which can be seen through our work in association with Dive Against Debris, a Project AWARE innovative. We have been conducting surveys of rubbish collected weekly at a particular dive site, currently Oliver’s Canyon. We collect as many bags as possible within our dive limits and then count what we get, for example how many drinks cans, plastic cups, fishing nets etc. We then enter this information onto Dive Against Debris data collection online. This means they can collate large amounts of information globally. Please note that we do not receive any funding from Project AWARE to do this – we are just eco geeks! 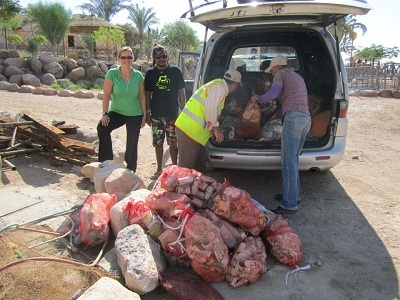 Locally we are trying to work with the Royal Marine Conservation Society of Jordan as they run educational projects. Preventing rubbish from getting in the sea in the first place is the key and acting in the local community to change attitudes and disposable plastics use is priority. We try and lead by example – we take reusable cups for your post dive cuppa rather than the plastic or paper ones we find whilst cleaning up! Additionally our staff pick up rubbish on every dive and often on the beach during the surface interval. Emerging from the water with a bag of rubbish often leads to questions from local people, leading to impromptu education beach side! Our passion for the environment does not stop when we leave the water though. We are proud of the fact that our efforts within our centre as well as the water have earnt us the PADI Greenstar Award. Some of the things we do to reduce our impact on the environment are: reusing the water we rinse the equipment with to water our plants, being very proactive about switching off lights and never leaving computers or the TV on standby. Due to our location we have no need for heating which already eliminates a huge amount of carbon. In the summer we use the air conditioning very minimally as our dive centre is insulated and so it is pretty cool. Our equipment comes from abroad, but to reduce air freight we usually get friends to bring items back with them when they go on trips. All our PADI paperwork is done online and so we are pretty much paperless. This means we produce very minimal waste. When visiting the beach do not stray into any areas cordoned off by the marine park, they are there to let the beach and coral recover from human interference! Take all your rubbish away with you and encourage others to do so to. Do not touch or take away any of the reef – just breaking a ten centimeter piece of hard coral is destroying a decade of growth! So be careful where your fins are and use entry and exit points rather than swimming over shallow reef. Buoyancy control – use it! Make sure you are swimming over the reef not on it! Our Instructors teach the Peak Performance Buoyancy Specialty course and so if you want to polish your skills and look after the reef at the same time sign up! Do not feed the fish or other sealife, they have all they need and feeding them will change their behavior and the ecosystem. Do not touch, ride or harass any of the sealife. Our fish are not aggressive unless provoked and some of them have seriously venomous spines, so everyone is safe if we are all hands off. Get involved with one of our clean up and surveys. Whether that be collecting rubbish on the dive, on the beach, helping us count it up after or just spreading the word about ocean debris. Get involved with Project AWARE – sign the shark petition, join a clean-up action through Dive Against Debris near you or with us, donate to help further AWAREs work online or through us when you arrive. You can also do the AWARE Specialty course with us and so you are fully equipped to inform others! Eat at our local restaurants, all the fish are local. Ask us for recommendations if you like. Look for locally caught, sustainable and not at risk species at home too. You can help look after our reef directly from your home. The WWF states that the biggest threat to coral reefs is coral bleaching, caused by the rising water temperatures associated with climate change. Be aware of your carbon footprint (try the carbon footprint calculator below) and try and reduce it… If you’d like to offset your flight to us then follow this link. Remember, take only photos, leave only bubbles!